lured us—a ship of heroes. the land firm under your feet. you are the strongest of all. Come, I sang, into my arms. breasts whiter than sun-cured shell. each of us skilled as Aphrodite. and sang to us instead. Sandi Leibowitz writes fiction and poetry for adults and children, mostly fantasy, often based on myths and fairy-tales. Her works have appeared or are forthcoming in Apex, Goblin Fruit, Mythic Delirium, Jabberwocky, Abyss & Apex and Cricket. When not writing or being a school librarian, she performs with NY Revels, the classical vocal ensemble Cerddorion and the early-music trio Choraulos. A native New Yorker, Ms. Leibowitz shares her aerie with some ravens, two ghost-dogs and the occasional dragon. Sometimes a line or phrase enters my head and insists on being turned into something. It doesn’t always work—but I usually try. When I was a kid, I kept notebooks littered with such phrases, or scribbled them on scraps of paper, but seldom did anything with them. When I began to take my writing more seriously, I paid better attention to these whispers from the muse. At other times, an idea for a narrative forms, or some piece of myth or fairy-tale beckons to me. Other times, I actively think about some issue or story I want to write a poem about. 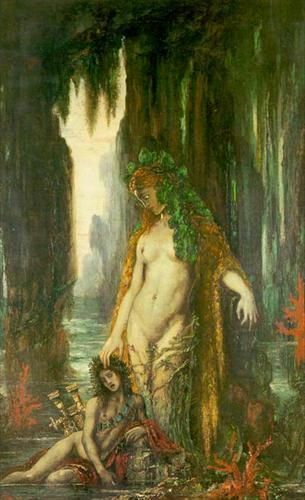 When I wrote “The Siren Hears Orpheus”, I’d just read a passage alluding to the story of the sirens hearing Orpheus. I’m a singer and wondered what it would be like for a magical being whose life centers around singing to hear the music of someone so far superior to her. At the time I was studying early Italian opera and Baroque gesture with NY Continuo Collective; the poem originally had the siren aiding her art with a hand movement (it ended up not working for the poem). As a writer and a musician, I always strive for beauty—and don’t always succeed. The poem is about that striving, and about what it's like to be swept away by art.